Considering I just reviewed The Chittlin Circuit 1.5, I figured it would be appropriate to backtrack to where it all began for Little Brother: The Listening. While this debut album from Little Brother has been critically acclaimed, it has also been criticized for bland and repetitious production from 9th Wonder. Again, as I stated in my review of The Chittlin Circuit 1.5, The Listening is one of 9th Wonder's earliest projects, and he obviously had not reached his peak at this point. Regardless of what 9th's critics had to say, I (for the most part) enjoyed the production on The Listening. Did it get bogged down at some points? Sure, but overall, the record makes for a perfect companion (that actually sounded kind of gay) when you just want to chill and get some stuff off of your mind. It is certainly not Little Brother's best work, but it is still good, nonetheless. 9th Wonder opens up with what is probably the second-best beat on the album (you'll see why I said "second-best" later). 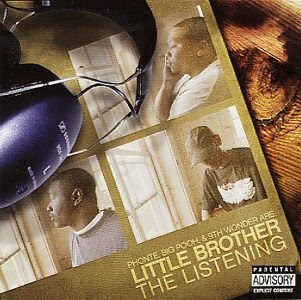 Strangely enough, Phonte, clearly the "frontman" of Little Brother, is absent from this track. That's actually not too big of a problem in my opinion, though, as I have always preferred Rapper Big Pooh. As you can guess, this song is about...well, groupies. It may seem lame, but it is actually one of the best tracks on The Listening. I just wish there was more rapping instead of talking, screaming, or whatever that is at the end of the song. The production here is decent, but Phonte's rhyme scheme just seems off, particularly in his first verse. Once again, Pooh outshines him on this track, but that doesn't necessarily mean he was ripping it, either. Decent cut; nothing spectacular. I love the production here. It's a bit unorthodox, but it's good, nonetheless. As usual, Big Pooh is the stronger of the two MCs on the track, spitting: "I let my life shine in between these papers' lines, I write rhymes to incite minds, spending time on this pipeline, eighty-five, north it's like mine, going eighty five to light minds." You really have to listen to the entire verse to appreciate how sick Pooh is on this. It's probably one of the best verses he's ever spit. This was the album's first single, and it's pretty solid. The beat sounds perfect to listen to on a sunny morning right before breakfast; all it's missing are some birds chirping in the background. Anyway, I really like the bassline on this. So far, the production on The Listening doesn't seem too insipid at all. I really liked this track the second I heard it. Don't ask me why, but every time I listen to it, I think of the "do you see what I see" Christmas song. The vocals in the background just kind of give off that vibe. Now that I got that out of the way, this song is about Little Brother trying to find the right chick. Lame? Maybe, but this concept has to be done on every album at some point, right? I love the sample that was used here. The production really is outstanding, further negating the notion that The Listening is a one-hour snorefest. "Shorty On The Lookout" is, without a doubt, one of the album's best tracks, and Median, a fellow Justus League member, makes one of only three guest appearances on The Listening (and one of the three was by Chaundon on the forty-five second album introduction called "Morning" which I did not even include in this review) and actually drops two verses. This one is pretty damn good. Phonte and Big Pooh go back and forth and trade short verses throughout the record, and both of them do a more-than-solid job, even if they don't exactly blow you away with any standout lyricism here. I really love the production, too. Nice job, 9th. I remember liking this when I first heard it, but then the effect wore off after a short while. The little kid, girl, or whoever that is saying "the show-stoppin' MCs" throughout the track is just annoying, and the beat is pretty blah. Definitely not one of my favorites on The Listening. This was the second single, and I have to say that I like the remixed version of it on The Chittlin Circuit 1.5 much, much better. That said, this is still a pretty good song, consisting of an extravagantly chill beat and some smooth (and uncredited) vocals over the hook. Still, of the album's two singles, I have to say that I like "Whatever You Say" better. Which brings us to, by far, the best song on the album. The beat here is absolutely incredible, and what's funny about that is this is the only beat on the album that 9th Wonder did not produce by himself. A dude by the name of "Eccentric" is actually credited as the primary producer here with some assistance from 9th. Maybe the whole "9th's beats are bland" proclamation has some merit, then? Nah, but let's focus on "The Getup." Although the hook is as simple as can possibly be (it's literally just "getup, getup, this is the getup, getup, getup, this is the getup"), it's very addictive, much like the production. Darien Brockington also drops by to add some nice flavor to the track. Remember when I said "War" was the best song Little Brother ever put out? Well, "The Getup" is second. 9th Wonder drops another sick bassline here, and I love how he incorporates the vinyl sound into the track. This song is actually very introspective and is probably the most thought-provoking record on The Listening. In the case of Big Pooh, he angrily raps about his poor relationship with his brother and how they do not even speak anymore. Phonte, on the other hand, talks about his love for his daughter. The contrasts between the two artists' stories easily make "Away From Me" one of Little Brother's most impressive tracks to date. Eh, this track is pretty boring. The beat doesn't really do much for me, and Keisha Shontelle's vocals just don't seem to fit. Neither Little Brother MC actually raps on this track. Instead, it's an instrumental by 9th Wonder with some uncredited vocals. I really like this, though. The beat is hypnotizing, as are the vocals. The title essentially describes the tone of this song, as it is perfect to play at night. Phonte raps alone here, and while that would normally be a turn-off for me, I think he does a solid job: "Aiyyo, it's the new fla-vor, the next step Phonte, the best kept secret since the AIDS cure (word), I stay raw, whether they bootleg it or pay for it, old school like Prince Dejour." It's the mesmerizing beat, though, that really makes the track go. I might have liked this a bit more if it weren't so long (it clocks in at six minutes and eight seconds), but even if the length were to be cut down, I probably still wouldn't dig this that much. I'm just not too crazy about the beat. This was not a very good way to end the album, but the rest of it was so good that it doesn't really matter all that much. The title track will not be the lasting impression I have of The Listening. While I can see why some people might find the production here to be a bit monotonous, I really like it. Nowadays, 9th Wonder's beats generally don't sound anything like this, as his beatmaking skills have advanced considerably over the years, but that doesn't mean that he didn't do a heck of a job on The Listening. Perhaps if this album weren't so long, critics wouldn't have as much to say about it, as they wouldn't have a chance to knock the production for being so limited. I think if you really sit down and thoroughly listen to this record, though, you will see that 9th's production certainly varies and that each track does, in fact, sound distinct from the last. There were really no significant low points on The Listening for me to harp on. As a whole, I think this was a very good album. I don't think it was as good as The Minstrel Show or The Chittlin Circuit 1.5, but it was a bit better than Getback and undoubtedly superior to Little Brother's final (and, in my opinion, somewhat futile) project, LeftBack (note: by the time Getback was released, 9th Wonder had left the group, and "Breakin' My Heart" was the only track on that album that he produced. He did not produce a single track on LeftBack). So, now that you have read this review, go cop this album, then find a quiet place with no distractions, throw some headphones on, and drift out to the smooth, serene sounds of 9th Wonder and Little Brother.